As the modern worship movement has impacted more and more churches around the globe, and Christian and gospel albums in their thousands are circulating more and more songs to fellowships and individuals receptive to what God is saying to the churches, "spontaneous" or "prophetic" songs are now appearing on albums with seemingly increasing frequency. 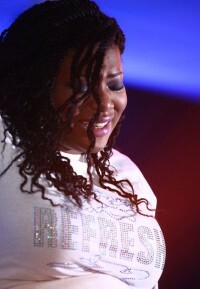 Now Chicago's award-winning Psalmist Raine has taken reliance on the Holy Spirit music making to a new level with the release of a CD and DVD 'ReFresh Worship Live'. Psalmist Raine's groundbreaking project was described in a press release, "On October 17, 2015 at Chicagoland Christian Center Embassy, Raine, her singers and band stepped to their mics and instruments to record an entire album, having only learned the opening song. The rest of the songs were given to the psalmist live and on the spot." I spoke to the lady about her life and music. Tony: Tell me about your start in gospel music. Raine: Well, actually, I've always been singing. My parents would say that I started singing at six months. There was a sitcom called All In The Family and I used to sing the theme song, at six months, and ever since then I would be singing around the house just going and doing it. It was something that I loved to do. And of course, growing up in a Christian home my family has tremendous roots and background in the Church and singing. So they started just putting me on different platforms. But professionally it started at the age of four when I used to sing on a radio show every Sunday morning. At six o'clock in the morning at the age of four I would go every Sunday and sing on this radio show, Isabel Johnson Gospel Radio, here in Chicago. So ever since then it has continued. My parents saw the gift, they started working with it and cultivating it and just making sure that I was in the right environment that would enable me to flourish and grow. Tony: It's very unusual for somebody to be ministering as a child. Was there a period when doubts and worries came in? Raine: Oh, absolutely. There was a season in my life when I was between the ages of eight and 12 where, you know, you start to get into other things at school. I was doing other things that normal kids would do and so things slowed down with my singing in churches. I remember one time, I was 12, being in my basement at home and I was crying because I was trying to sing like I was used to singing and it felt as if my gift was gone. I remember crying because it was a part of me. It was like I had run away from it for whatever reason or I just didn't do it and instead of it being in the forefront it had kind of slid to the back. And I remember crying oh my God, I want to go back to doing that. That was at the age of 12 and ever since then it seemed like that was a rejuvenation for me in the area of singing because in high school I started doing a lot of things, singing in the choir, and it was like my gift was rejuvenated. Ever since then I have sung consistently whether it was in groups, choirs when I was singing lead or whatever. Tony: Have you always been a songwriter or did that come later? Raine: That came later. It started with my first album which was 'Believe Again: The Live Experience' and that was in 2012 we actually recorded that. I never thought of myself as a songwriter at all. So I would sing a lot of cover tunes but when I released my first album that writing anointing propelled me to keep moving forward in that area. Tony: I know some folk who've got some difficulties with the whole idea of a modern day psalmist. Their idea is that we know who the original bunch of psalmists were. What makes you a psalmist as opposed to a singer/songwriter anointed by the Holy Spirit? What singles you out as a psalmist? Raine: My ultimate goal and responsibility when I go before a gathering of believers or whatever is to always release the message of the Lord. So I could go into different environments and my assignment for that environment is Father, what is your heart as pertains to this group of people right now? That song may be a song that is already in the earth or it may be a song that is not yet in the earth, but my responsibility is to release that message that God wants me to release to those people through the area of singing. I believe the tool of music is so great to use to be able to cleanse and cultivate the heart of God's people because we know that music can invade our spaces without even permission. Because of that I think God, in all of his wisdom, uses the tool of music to be able to release his message that will really dig deep into the soul and heart of his people. I use the avenue of worship, of course much like the psalmist David; he spent a lot of his time with praise and worship, and that's how I started with this responsibility of a psalmist, through my training in praise and worship. I would always start off with gathering the people and shifting our focus to the Father and what he desires and what he wants and we praise and worship him and then we always shift to releasing a message from God's heart to his people by way of song. And David, they did it, they operated on the truth; they would tell about their issues, they would tell about what they had and would exalt and magnify the Lord and they would always remember the truth that was released in Scripture. These were inspired by the Holy Spirit. I believe it is my responsibility, different from a singer who could go and just sing a message of encouragement and it could be more of a horizontal kind of basis: "I'm singing a song of encouragement from my heart to reach your heart." Whereas the psalmist's initial responsibility is vertical. So it's between us and God. Then God responds to his people. And I'm just a mouthpiece at that moment that does it by way of music. Tony: But what seems different to me is that none of the singer/songwriters I know who, on occasions, sing out prophetically would call themselves psalmists. Is it simply the level of prophetic anointing that you're receiving which is different from those other worship leaders who are singing prophetically? ? Raine: It could be. It is really the purpose for which that person is called. There are a lot of people who are worship leaders and their responsibility is to literally do that - lead worship, they lead the congregation or the people into worship. And much of what they experience, that anointing that comes upon them to prophetically sing, it is literally what I do. But it's different from just being able to do it and then having the responsibility or the burden to do so. I feel it's my responsibility to go out and a lot of times I can go and God will call me to create a song right on the spot or to have my ears opened. But it's a responsibility that I have versus someone that is a worship leader that is a flowing into that vein. We all can prophesy. Every believer whether you are called to teach, evangelize or whatever, we all can prophesy. And we should all have that desire to prophesy. But there are the prophets that have the burden, that responsibility to walk it out in the earth. So for me it is the same thing like a worship leader versus the psalmist. We lead people into worship, we move forward in that vein and then that anointing comes when God begins to speak, in an atmosphere that is filled with faith. He begins to speak as that worship leader releases and becomes the mouthpiece of God. Sometimes it can be on and sometimes it can be off whereas for me it is my responsibility. Tony: That is your responsibility. Have you encountered any resistance to the name? By putting that name psalmist in front of your name, has that brought any negative reaction at all? Raine: No. I haven't experienced that because the fruit shows. You just do what you're called to do and do what you're supposed to do and the fruit will speak of it. That is my only focus. I have not experienced a negative connotation of psalmist. Tony: And you have seen fruit? It was a pretty brave thing to do to organize a recording and video where you were really going out on a limb a bit and doing this album without having much in the way of preparation, just one song. What fruit have you seen from that whole exercise? Raine: One of the things we experienced that night was that. . . Even if we tried, in our whole human effort to make sure that things were perfect, it could never come out the way that it did. We walked on stage with literally only one song and the rest of the entire album was birthed and created on the fly. I could not orchestrate what the minstrels would do; I could not orchestrate what the background singers would do. We spent a lot of time in prayer; we spent a LOT of time praying. But we also took a lot of time training and preparing to constantly be ready for a river of the Spirit to flow. So that's what we did in our time of preparation, but the evidence of that fruit is when you have people who were there or even who were not there have life-changing experiences and have their own personal revivals as they're listening to this album. It is literally doing what it was called to do which is to refresh God's people. Scripture tells us that times of refreshing come from the presence of the Lord. My endeavour was to create a space where God was tremendously comfortable, where he could speak to his people. Evidence of the psalmist or the message being released was the track "The Great Shepherd". "The Great Shepherd" was a response that I heard the Lord speak to his people. We have songs saying "God, we desire you, we need you," and after we prayed and we asked him, "Father, send your power, send your presence" and his response was "I'm the great shepherd; I'm tending my sheep." That was the message that I heard, that was what was released and it still continues to bless God's people. I get testimonies all the time of people getting delivered from mental diseases like schizophrenia, being delivered and actually being released to move forward in purpose into what God was calling them to. I hear how it helps them to really seek God, go before his presence, and that was the objective. The objective was to create a space full of the presence of the Lord where he can speak to his people. So when people listen to this album it is not for them to be consumed with a lot of worries but for their ears to be unlocked to hear what God is saying to them, whether it is through the songs or whether God is speaking to them personally. That was our objective, that's the fruit that we see, the testimonies that I hear consistently all the time since it's been released. Tony: It sounds to me like the album is a carrier for revival. We're hearing a lot of talk about the Church in desperate need of revival, the whole Church, not just the American Church. There are definite signs now that in different places around the world there are individual churches which are being caught up in revival. My hope and prayer is that it will extend outwards. Presumably your hope is that revival which you personally experienced and your church is experiencing will extend to the whole of Chicago and then go national. Is that your hope? Raine: Yes, my hope is that it will actually go global. This album is in different places. I've heard testimonies from Africa, from the Bahamas, even from the UK. That is revival I believe and it's been confirmed through different prophets that this album will be a piece of the puzzle to this revival that is happening through the body of Christ. Absolutely. All over the world. The full Tony Cummings nterview with Pastor David Daniel.